❄️ MATERIAL: 925 sterling silver and Zirconia. Upgraded 5A Cubic Zirconia.100% Brand new.Nickel Free and Lead Free, does not trigger any allergic reactions. 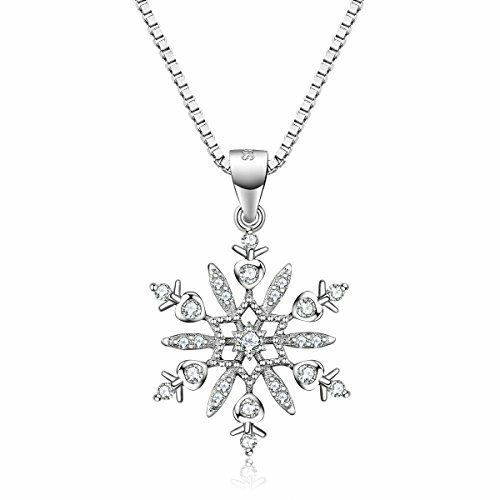 ❄️ SIZE: Pendant: 18mm*15mm(0.71in*0.59in). Chain: 45cm(17.7in) high quality box chain. ❄️ PACKAGE: The necklace is presented in a beautiful branded gift box, perfect as a Christmas gift, Valentine\'s Day gift, Mother\'s Day gift, birthday present, wedding anniversary gift. ❄️ QUALITY ASSURANCE: If jewelry has any quality problems, please feel free to contact us and we will send you a new one (Within 14 days). Two years of quality assurance. Now order your J.Vénus jewelry without any risk!